The only two characters that made the new word NUCULAR famous are Homer Simpson and W. And Bart's father learned to say "Atomic" in 12th season if my memory doesn't fail me. Certainly comedians and politic satirist got it too easy all these years, and that's why anyone of them wanted to vote for Obama because they actually would have to think again. It's unfair to say that the Bush administration was all bad, we've had a fair share of laughs, it's a lesson to all our children who want to be on a spiderman comic cover on their presidential inauguration day, what not to do if you have to give an speach on national tv. He's on the cover of Spider Man, he can do anything. There's a lot to say about George W. But this issue is not called Bush, but Obama. So, i've been wandering the web to find some funny Obama moments, but didn't find any... Well at least not one to laugh at, but a few to laugh with. The first one, watched it for the first time live on Letterman's show, and immediately posted it on my facebook wall, and to all my friend's list. Sadly the audience is yet not that big. Bush's daughters got it for free... and Obama's daughters will have to wait till second term! 6.- I'll put Regis on the nickle. Why Not? 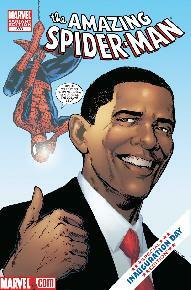 He's on the cover of Spider Man Comic, he can do anything. He just needs to be on a Simpson's chapter and achieved more than W. In 8 years. 4.- He won't let Apple release the new Ipod the day after you bought the previous model. Eat that Jobs! It's a great way to face the crisis. Cheaper ipods for everyone! 3.- He'll find money on the budget to buy Letterman a decent hairpiece. 2.- Pronounce the world nuclear, NUCLEAR. That's the way to win an election. Focus on education since day one. If she can't run the country, anyone can!! You've seen Obama dancing on Ellen, and laughing at himself at Letterman's and many other shows. But after two senate terms and a presidential election you haven't seen anybody else laughing at him, Reps tried but you see what happened on November 2008. Certainlty this is the kind of leader I would follow, someone no laugh with and not to laugh at.